We all know dental floss, that ever-important tool to cleaning mouths of bacteria, plaque and other build-up. But did you ever wonder how it came to be? 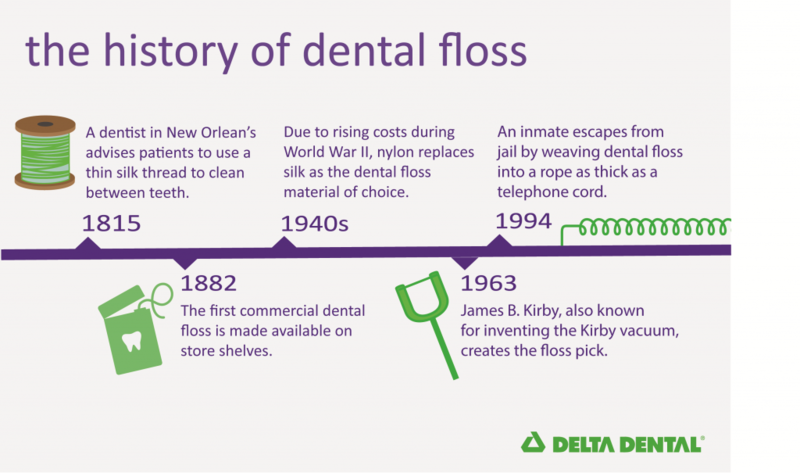 In 1815, a New Orleans dentist advised his patients to use a silk thread to clean between their teeth – giving us our first version of dental floss. In 1882, Codman and Shurtleft began manufacturing the first commercial dental floss from unwaxed silk. In the 1940s, due to the rising costs of World War II, nylon replaced silk as the material of choice for dental floss in the United States. James B. Kirby, also known as the inventor of the Kirby vacuum, created the first floss pick in 1963. The floss pick is a Y-shaped angled dental tool that doubles as a toothpick and dental floss. In 1994, an inmate managed to escape from jail by weaving dental floss into a rope as thick as a telephone cord. Today, dental floss is most often made from a combination of rubber and plastic which is coated in wax.